As they prepare to launch another IPA series in cans (the rather less obviously IPA like Milkshake series, of which more when the Salted Caramel tinnies appear), the Juicy series rolls on at 3 Ravens. This time around, it's another single hop variant based around the darling of the Australian hop growing program, Galaxy. 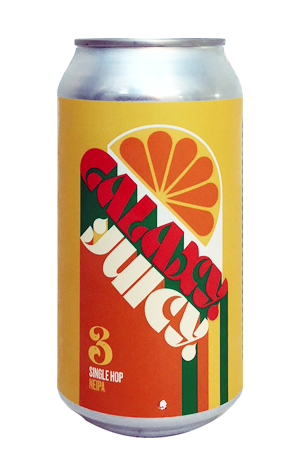 You'll no doubt have had about 1500 beers featuring the Galaxy hop in the past few years but, it has to be said, if you can get your hands on one of these fresh (which is the whole idea with NEIPAs, after all), it's a beer that offers as good a reminder as any of why this particular hop has become so sought after globally. Its passionfruit led aromas seem to the manor born for this fruitiest of beer styles, with Galaxy Juicy coming across like a tropical Splice variant, albeit with a body that's creamy in texture rather than creamy in essence like the horde of lactose-laden beers appearing these days. If memory serves, it appears to be hazier, fuller and softer that many of its Juicy siblings, yet without losing that fruit juice tang necessary to offer textural balance instead of a traditional IPA's bitterness. Definitely up there with the best of the series.